Advances in computer hardware and software, data storage and processing, optics, systems and instrumentation, labeling agents, and reagents have all contributed to the current surge in imaging in the life sciences. Click here to read more about Imaging Systems for Biology. The Labnet ProBlot™ 25 and 25XL high capacity bench rockers have been designed for a long life and trouble-free service. Rocker speed is adjustable to provide the gentle motion required for staining fragile gels as well as the more vigorous action necessary for washing blots. The ProBlot™ 25 platform measures 28.9 x 20.3 cm, while the ProBlot™ 25XL platform is slightly larger at 30 x 30 cm. Both platforms can be doubled stacked. Please visit Labnet for special deals. 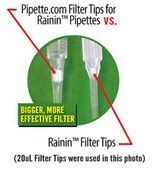 Pipette.com Rainin LTS TipsDesigned for LTS and XLS Rainin pipettes Pipette.com LTS line of tips are a quality economic alternative to the Rainin tips. Molded utilizing special resins our LTS tips require the least mounting force in the industry while still providing an airtight seal. This ensures that tips are able to properly mount on pipettes even with worn out barrels. Tips are available in Bulk, Racked, Racked/Sterile, Eclipse Reload and Filtered packaging. I have a 42R with a blank display. I installed a new display board. Unit worked for 3 hours just fine. Now display just shows blue. After turning power off then on, display comes on then turns blue. What do you think? Advise this member. I need to replace the pump assembly in a ICS2000. Can anyone give some pointers on how to remove the defective pump? When we open the left side panel it appears as if there isn't enough room to remove the pump. Any hints would be appreciated. Advise this member. We are using Typhoon FLA7000 to measure the radioactive product of an enzymatic reaction using carbon-14 as a tracer and would like to know the units measured by this imager are arbitrary and whether there is a way of converting these units to GBq or microCi? Advise this member. Sartorius Stedim Biotech (SSB), a leading international laboratory and pharmaceutical supplier, introduces a completely new concept for packaging pipette tips: FlexiBulk. The new package with its well-organized tip arrangement saves valuable space in the laboratory. Read more. Developed in conjunction with several leading laboratories the handheld device offers users the ability to cap a row of 8 tubes in 5 seconds and a whole rack of 96 tubes in only 1 minute. The Screw Cap Recapper is 10 times faster than manually capping tubes thereby minimizing sample evaporation and significantly improving your productivity. Read more. Lonza has today released the latest addition to its L7™ hPSC System, a robust, streamlined and comprehensive platform for the generation of human induced pluripotent stem cells (hiPSCs) and the maintenance of stem cells from a variety of sources. Read more. Motic's manufacturing base in China consists of five fully-owned subsidiaries manufacturing components for the company with Motic Xiamen acting as production headquarters of the company. It plays an important role not only as the manufacturing center, but also as an ideal location for research and development. We have an established R&D center in Xiamen with over 100 professional engineers and technicians, covering industrial design, mechanical, optical, electronics, software and multi-media aspects. Visit the Motic website to see their full product line. The silicon belt is broken. I bought a new one but it was not the same quality as the original one. Anyone know a better one to buy? Advise this member. I have a centrifuge that is showing error 16. What do I do to solve this problem, could you help me? Advise this member. My Agilent 7890A GC keeps showing me "Back inlet purging" while no command is given. Please could anyone help me? Advise this member.